I haven't posted a muffin recipe in a while, but not for a lack of trying. (By the way, I am never going to post a recipe that I don't like. Why encourage you to try a recipe that I don't want to make again?) So this is what has been going down in my kitchen since the last muffin recipe: First I strayed from muffins for a bit and made a banana chocolate chip bread from A Homemade Life. I thought it was a little dry and not enough banana flavor. 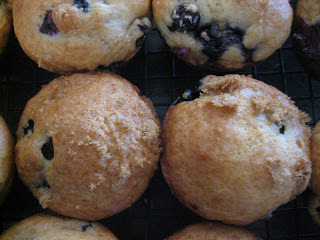 Then I made some blueberry cream muffins, and then some buttermilk blueberry muffins. I didn't love either of them, but thankfully Caleb is easy to please and ate both batches. I was beginning to think that me and blueberries just weren't meant to be. But then the other day I was going through my recipes and realized I had skipped over my favorite blueberry muffin recipe. So I made a batch today and am pleased to say I like them better than the previous two. I do think that it is difficult to find the perfect blueberry muffin recipe, but for now this is my go-to. Place blueberries in a colander and rinse them well. I then go through and pick off any of the little stems still intact. (side note: I bought the most beautiful blueberries at the grocery today, but there were just a few little stems. I know picking blueberries is tedious, so I'll give those blueberry pickers a break.) Set aside and let any excess water drip out. In large bowl, sift flour, baking soda, baking powder, and salt. Set aside. In another bowl, whisk together sugar, oil, vanilla, egg, and yogurt. Fold into the dry ingredients and stir just until comes together. Be careful not to overmix. Add the blueberries and carefully fold until evenly distributed. Be careful not to smash any of the blueberries. I hate when there are blue stained patches in my muffins. Spoon mixture into greased muffin pans. Sprinkle the tops with brown or turbinado sugar, if you want. Bake 20-25 minutes at 385 degrees. Makes 2 dozen.